Team Naranja's Yann Caleri from France, right, ties a different fly to his line during day 3 of the America Cup fly fishing tournament at the Black Lake on Vail Pass. The recent rain, which washed out much of the Colorado River, meant decision to move one of the competition locations from the Colorado River to Black Lake. EAGLE COUNTY — Under rainy skies, the America Cup wrapped up one of the most challenging years in the young tournament’s history Sunday. 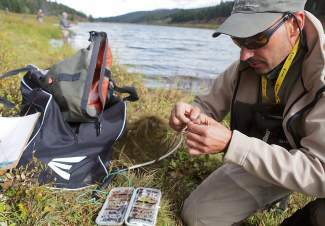 But despite a venue change, diminished volunteer presence and a scoring controversy, competitors described the Eagle County-based fly-fishing tournament as a rain-soaked paradise. Sullivan said he got in early and spent a warm-up day at practice fishing in the brown waters of the Colorado River, a day he enjoyed but gleaned no actual tournament advantage from. Competitor Brandon Withrow said Black Lakes, near Vail Pass, ended up being the great equalizer. With 14 “beats,” or territory areas for anglers along the Black Lakes banks, “Your fish had to swim right through your beat to catch him,” Withrow said. Anglers fished three different beats for one hour per beat at the Black Lakes venue. Withrow said in addition to the Black Lakes curveball, the other big challenge for him was simple exhaustion. Three-day tournaments such as the America Cup aren’t as common in the sport — competitors fished two sessions on Friday and Saturday and one session on Sunday. A session lasts three hours. “I was in bed every night at 8 p.m.,” Withrow said. For judges at the event, getting to bed early wasn’t an option. Judge Adam Papuga drove in from Grand Lake, arriving at noon on Thursday, and basically worked straight through to Sunday. Papuga said the volunteer presence was severely affected by the flooding on the Front Range. Always impressed with the America Cup, popular outdoorsman and television personality Tred Barta said he was glad to be a part of another great week of competitive fly-fishing in the Vail Valley. With an international field and former world champions like Frenchman Yann Caleri on hand, the competition was the toughest you’ll see at a tournament in the U.S., said Fly Fishing Team USA member Pat Weiss, of State College, Penn. Nationals are Oct. 4-6 and are nearby this year, just down the road from Eagle County in Basalt. At press time, Weiss was seated third overall, with Caleri second and Team USA member Devin Olsen in first, however a controversial rules dispute still had scores far from solidified. At Sunday’s Lake Dillon venue, Caleri and Olsen were among several anglers who didn’t reach shore within the allotted time frame. Knight said the error was a mistake on the part of the “controller,” an official in the boat with the competitors, and not the anglers. Log on to theamericacup.com for final scores or more information.